The 1st Continental Light Dragoons, also known as Bland’s Horse, was a mounted regiment of the Continental Army organized between 13 June and 10 September 1776 in Williamsburg, Virginia from eastern and northern Virginia for service with the Continental Army. 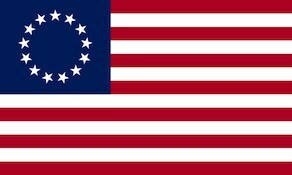 The regiment was first authorized 8 June 1776 in the Virginia State Troops as the 1st, 2d, 3d, 4th, 5th (Captain Henry “Light Horse Harry” Lee) and 6th Troops of Light Horse, and on 25 June 1776 mustered as the Virginia Light Horse Regiment. It was first adopted by and then accepted into the Continental Army, designated as the 1st Continental Light Dragoons on 25 November 1776. On 31 March 1777 in General Orders, George Washington named promoted officers of the 1st Light Dragoons. Theodorick Bland Esqr., Major, Comdt. to be Colonel thereof. Capt. Benjamin Temple of the 2nd. Troop is appointed the Lt. Col. Capt. John Jameson of the 3rd. Troop is appointed the Major. Lieut. Cuth. Harrison of the 2nd. Troop is appointed Captain of the same. Lieut. Alexander S. Dandridge of the 4th. is appointed Captain of the 3rd. Lieut. John Belfield of the 5th. is appointed Captain of the 6th; vacant by the resignation of Capt. Nelson. Cornet William Lindsay of the 3rd. Troop is appointed Lieutenant of the same. Cornet William Watts of the 4th. is appointed Lieut. of the same. Cornet Henry Peyton of the 5th is appointed Lieutenant of the same. Cornet Henry Clements of the 6th. is appointed Lieut. of the second. Mr. Cole Diggs, Cadet, is appointed Cornet of the 3rd. Troop. Mr. Robert Yauncey, Cadet, is appointed Cornet of the 4th. Troop. On 7 April 1778 Lee’s Troop was replaced by Captain Addison Lewis’s troop. Lee’s Troop then expanded into Lee’s Legion, designated the 2nd Partisan Corps in 1781. The 1st Continental Light Dragoons were re-assigned to the Southern Department on 8 November 1778 when the Corps of Continental Light Dragoons was broken up as an organization. The regiment was officially re-organized on 1 January 1781 consisting of four mounted and two dismounted troops and redesignated the 1st Legionary Corps. On 2 November 1782, reflecting an amalgamation that had occurred in the spring of 1780, the unit was consolidated with the 3d Legionary Corps, maintaining five troops, and the new unit was designated 1st Legionary Corps. The regiment saw action at the Battle of Brandywine, Battle of Germantown and the Battle of Guilford Court House. The regiment was disbanded on November 15, 1783 at Winchester, Virginia.